This topic contains 6 replies, has 2 voices, and was last updated by BenR 3 weeks, 3 days ago. In the attached image, I have SBS rows with a different number of fields per row (i.e. : row-1: 1 item, row-2: 4 items, row-4: 2 items. Row-4 spreads the two items across the table width, looking awkward. Is there a way to move the second item on row-4 to the left? This form has several other sections, and fixed column widths seem to affect the overall form – outside this particular problem section. In advance, thank you for your support and efforts! Can you show me a screenshot of the setup and of any custom css you use to style it now? 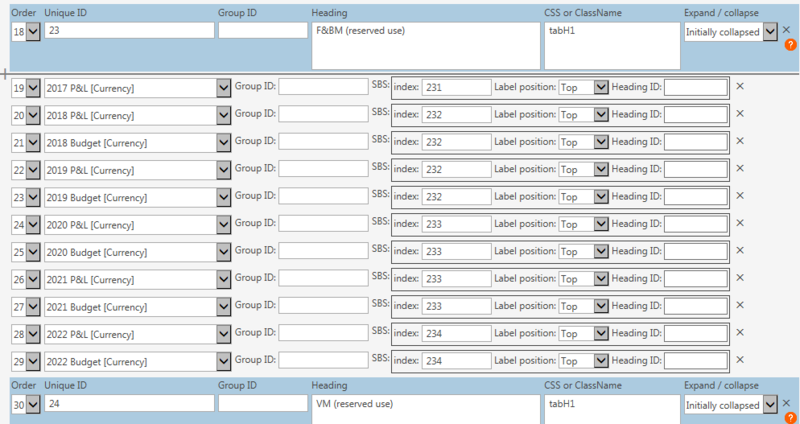 The following is on my Custom CSS tab, attached is a screenshot of setup. The addition of the Custom CSS did bring all the fields to the left, it is also affecting all the fields on three tabs… I’ve attached a screenshot that shows the result. However, in my case, the other sections of this and the other tabs are affected too much to use. Is there such a thing as a dummy field? In HTML, you would use a “spacer.gif” to force table rows into alignment… In my case, I would put two more fields at the end of the fourth row. This worked really well! I’ve used this method across each row in the table, and the layout is specific to only this one section of the overall form. Really appreciate your support and efforts!